A big believer in stream-of-consciousness storytelling, director David Lynch once likened his creative process to sitting in a chair and going fishing in his mind. 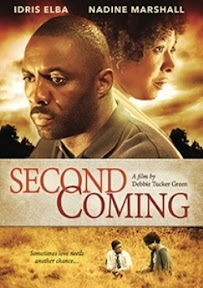 And although the latest release from Film Movement is easier to follow than Lynch’s Inland Empire, within the first half of Second Coming, it became obvious to this reviewer that Lynch just might have a potential fishing buddy in acclaimed British playwright and fellow visual thinker Debbie Tucker Green. Leaving vital pieces of information out of the script and drifting in and out of Second's scenes mid-conversation without explanation, Green opts to reveal things to the audience indirectly. Treating us more like eavesdroppers than participants, the director's fly-on-the-wall approach enables us to identify even more to adolescent boy in the film (played by Kai Francis Lewis) who’s trying to decipher what it is that’s going on right along with the viewer. It’s a great idea in theory and I applaud the way that she respects our intelligence enough to piece together the circumstances surrounding the seemingly biologically impossible pregnancy of the movie’s matriarch rather than spoon feed us with unrealistic, exposition filled dialogue. However, Green’s mind-boggling decision to clue us in through everyday conversation where the audio is often mumbled and/or parts of exchanges are drowned out over dinner makes it much more challenging than it needed to be. Suffice it to say, Second Coming is a far cry from the dialogue drenched feature debuts of most playwrights who have struggled to adapt to the “show me” medium of cinema. With so much kept off the page, out of frame, and on the cutting room floor, the film’s veteran leads (Nadine Marshall and Idris Elba) do what they can with what’s written to try and fully flesh out their roles in passionate turns that – much like the film’s gorgeous visuals from cinematographer Urszula Pontikos – do much to enhance the often maddening experience. A Sirkian kitchen sink drama given the Resnais Marienbad treatment, Green’s Second Coming marks an admirable if ultimately uneven attempt to blend the rich fantasy of magical realism with the harshness of contemporary neorealism. Unfortunately while it’s full of symbolic, allegoric, and intellectual potential, the film never fully comes together as something beyond an exercise in experimental filmmaking or a David Lynch style fishing trip.